BY ROOS AERTS. You start to feel the sun on your skin again here in Leuven and people begin to talk about their summer plans. When they do, I long back to my days as a volunteer in Cambodia. I dream about the bike rides to the school, where the children gratefully waited for the teacher to arrive. But I daydream about a lot more. Volunteering had always been on my bucket list, so when I got the opportunity to go abroad with AIESEC Leuven, I took that chance. And what an experience it was! 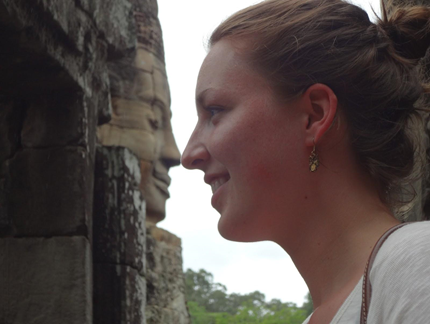 Roos Aerts is a master’s student in Business Economics. She tweets at @RoosAerts. Was it the fear of missing out on travelling that made me decide to step out of my comfort zone? Or was it because of the death stare my bucket list kept giving me? Probably both. The most important thing is that it happened, I stepped out of my comfort zone and dove straight into the endless possibilities the world has to offer. Two years ago, I became a member of AIESEC Leuven, which is an international student-run organisation active in approximately 120 countries. Our mission is to send students abroad for a professional or volunteering internship to increase their global and intercultural mind-set. Thanks to that membership I came in contact with the opportunity to volunteer all over the world and I decided to go on one myself. I favoured Asia because I went to kindergarten in Singapore as I lived there at that time. 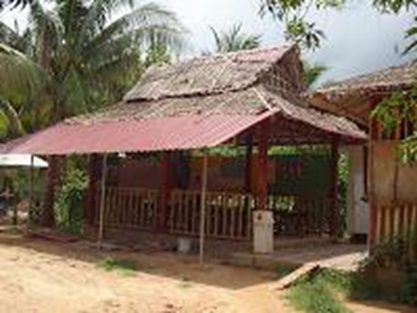 After some research, I fell in love with the vision and mission of Khmer for Khmer (KKO), a non-profit organisation in Cambodia run by a German couple and a local. KKO is a little school that provides students aged 3 to 26 years old with English lessons and sewing classes. Recently they have set up a small computer class to introduce the students and local inhabitants to the wonders of the worldwide web too. 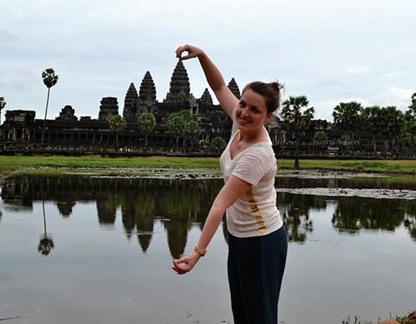 My project was located in the slums of Siem Reap, a big city that is popular for the Angkor Wat site. I guess most people probably know Angkor Wat; it’s one of the seven world wonders and the largest religious monument in the world. 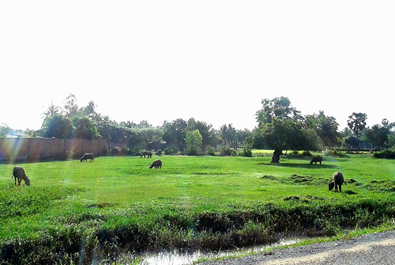 I went there several times by tuk-tuk, by mountain bike and on foot (very exhausting in the sun!). Before I flew off, my entrepreneurial spirit got triggered. On the Internet, a lot of previous volunteers advised me to fundraise money before leaving. I trusted their opinion and organized a fundraising event at my house with friends, family and colleagues. My application for a charity grant by my town council in Holsbeek also got approved. In total, I raised $3,000. I was very grateful towards all the people who contributed and so proud of myself! I could now help to improve the organisational side of the school, buy reading books and other school material for the kids and extend the curriculum. Besides that material support, it was my goal to inspire the kids and staff to live their dream too, regardless the conditions they were in. My time as an English teacher in the slums of Siem Reap was a very enriching experience. I learnt a lot about the culture in a short period of time because I spent so much hours with the students, staff, other volunteers and locals. Being all alone on the other side of the world to work on a project with people you don’t know can be stressful, but this feeling didn’t stay for long. My guesthouse was full of other volunteers from all over the world (Taiwan, Portugal, China, America, Singapore, Switzerland…). Together we prepared lessons, integrated in the local culture and got to know each other better. In fact, we made a great team! I taught from Monday until Friday in various classes. The venue itself was far from my guesthouse so usually I started my day with a 35-minute cycle tour or a bumpy tuk-tuk ride. Every time I arrived by bike, I was sweating like hell because, even at half past 7 in the morning, it was very hot… But, I did not complain. I had beautiful landscapes to enjoy and having a bunch of sweet kids hugging you as soon as you arrive, compensated too! In the morning, I taught English to 3 young ladies who were sewing students at the KKO. The main purpose of my class was expanding their general knowledge but most of all I wanted to get the girls out of their comfort zone. We did this by talking about different kind of topics such as table customs in Thailand. Being able to talk about these things is an advantage for these girls if they ever want to open their own sewing venture. The other hours, I taught young children aged 5 to 12 years old in ABC classes. I had to teach them exactly how to pronounce the sounds that were so different to their own (e.g. the ‘ch’-sound, so I wrote down words like chair, lunch or watch). It was a very challenging age category because they learnt English at a very young age compared to our school system. Reading is the most difficult part for these kids. The children know the alphabet but they can’t read the words on the board. Keep calm and smile was my motto! My last class consisted of older students with an average age of 18 years old. We discussed how the airport worked and what steps one must take to board the plane successfully. 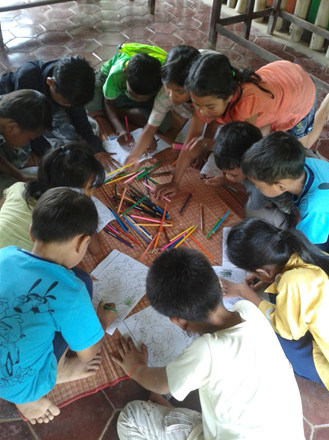 Besides teaching English, we also organized activities for the children. 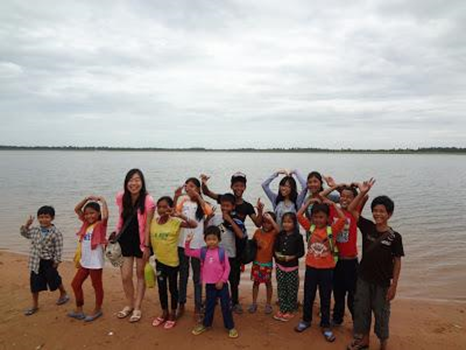 We went to the West Baray Lake, a giant reservoir constructed during the Khmer Empire, to play in the water. They never left their village, so these trips and moments were very precious and special for them. 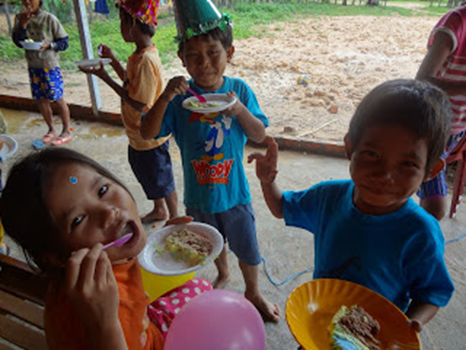 We also organized a big birthday party for all the poor children, since most of them either don’t know when it’s their birthday or they never celebrated it before. Result: a lot of happy faces! My experience abroad taught me how to get more enjoyment out of a moment. Driving around on unknown roads in a hot evening breeze is the perfect moment to feel you’re alive and fulfilled! By living in a yet-to-discover city at the other side of the world, you can experience how life is somewhere (anywhere) else. But the contrast with my Belgian home made me rethink how I see the world, others and myself too. Some kids at my school didn’t have two outfits; they wore the same old and dirty clothes every day. I‘ve seen sad things among the poorest children. It made me rethink my materialistic life. For example, I realized how unimportant my clothes were when I found myself hoping the colours of my nice clothes hadn’t faded after the laundry. It just wasn’t worth it. If you compare your own situation to how they live in less fortunate places, you realize that happiness isn’t found in things that can be bought. This is best reflected in the children; they didn’t have toys to play with, yet they were always entertained. They shared one set of colouring pencils (without making a fuzz!) and didn’t seem to be any less enthusiastic about their task at hand. On the contrary, they were more than happy to share them with one another and helped each other out. To conclude, I can definitely say that volunteering abroad gets you out of your comfort zone and that the impact it has on your personal development is inspiring. Dit bericht werd geplaatst in English, Onderwijs, Universiteitsleven. Bookmark de permalink . ← Waarom een opleiding islamitische theologie aan een katholieke universiteit? What a great story! Definitely food for thought about intercultural exchange.